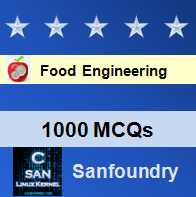 This set of Food Engineering Multiple Choice Questions & Answers (MCQs) focuses on “Oil Processing”. 1. Which of the following is untrue about Solvent extraction of Oil? 2. Which of the following is NOT a step in Pre-press Solvent Extraction? Explanation: Seed whipping is not a Pre-press Solvent Extraction step. Explanation: An Oil Press is called an Expeller. 4. Which of the following is true about Seed Flaking in Pre-press Solvent Extraction? Explanation: The flakes have to be an optimum size- neither to thick nor too thin in Seed Flaking in Pre-press Solvent Extraction. As thin ones are too fragile and thick ones give a poor oil yield. Explanation: All the given sentences are true. Explanation: In Solvent Extraction, the oil and miscella are moved in a Counter current manner so that the two phases are easily removed. Explanation: Stripping Solvent off a meal is called Toasting. Explanation: After toasting and before Refining, Oil is made into pellets by a hammer mill and stored. Explanation: Oil Refining is a step after Oil Extraction. Explanation: In Oil refining, oil is De-odorized and bleached. Explanation: Oil is extracted both, by Mechanical Extraction and Pre- Press Solvent Extraction. Explanation: In oil Refining, oil is Filtered / Centrifuged and De-acidified / Steam blown through Oil in a vacuum. 13. Butter made from hydrogenated oils is flakier than naturally saturated oils. Explanation: Butter made from hydrogenated oils is flakier than naturally saturated oils. This is because the hydrogen added in making the oils saturated is generally added to the ends of the chain, making it more brittle. 15. Which of the following does NOT refer to sparging of oil? Explanation: In Sparging of Oil, Oil is kept in vacuum and heated to smoke point. Water is introduced through the bottom. The water gets converted to steam. The steam bubbles through the oil and separates water-soluble impurities.